It has been credited to President Harry S. Truman, with the following famous quote: “If you want a friend in Washington, get a dog.” I have always been a dog person, so to speak. I appreciate cats as pets, too, and maybe one day I will have a cat for a pet, but the main pets in my life have always been dogs. My husband, not quite the animal fan that I am, has agreed over the years to let our family have a dog. Our first dog was Maggie, a standard -sized Dachshund. We had 3 children at the time that we got her, and she was very good with our children, patient, never growling at them, grateful I am sure, to sit near the highchairs and do her part in keeping the kitchen floor clean! Even when 4 more children were eventually added to our family’s size, it didn’t faze Maggie in the least. We even included her in one of our family’s Christmas pictures and my husband didn’t even object to that. Unexpectedly one Spring, when Maggie was 10, she died; an undiagnosed cancer was the culprit. Several years went by and then our 7 kids began the chant,” When can we get another dog?” Along came Marshall into our lives, in a neat and unexpected way. My husband’s oldest niece, Elizabeth, and her husband, Tim, were looking for a dog. Elizabeth has a view of dog’s much like my husband’s while Tim grew up always having dogs around the house. At his urging, they visited some animal shelters in their area of Southern Illinois and one dog, in particular, caught Tim’s eye. A 1 year old, male mutt, a Beagle and Basset Hound mix. He had been named Gotham, had a stubby tail, instead of the long tail commonly found on a hound dog, and this was the dog Tim chose. Gotham was renamed Marshall and he became a very fortunate dog. Marshall had been neutered, and after a trip to the vet for a check-up, he was ready to be loved upon and to reciprocate that affection to his new masters. Several years went by and Tim and Elizabeth were ready to begin their new life in Kenya, working with the Masai people. Elizabeth, a nurse, would be working in the community health arena and Tim would be helping to start up local churches, they had raised their financial support, had the town selected they’d move to, their slots at language school set, but what to do about Marshall. As much as Tim hated the idea, it looked like Marshall would have to go back to the animal shelter. Our family learned about this plan and after meeting Marshall one Christmas day, we said we would take him in. Tim and Elizabeth were relieved and Marshall was soon delivered to us with all of his supplies. Marshall seems like the laziest dog in the world. His day usually begins with getting up at 6:30 with me, as I get up with our two sons who attend Rolla High School. After Marshall has spent a bit of time outside, he barks once and I know that it’s time to let him back into the house. He then has his breakfast, and then trots off to one of the sofas in the living room for a nap. Once in a while he alters this by going back upstairs to the master bedroom to take his nap on the queen sized bed! Around noon, Marshall gets up from his slumber, and goes back outside for a bit, then back in to watch the unloading of the dishwasher, the making of lunch, hoping for scraps or leftovers of meat. After lunch is done and the kitchen put back to rights, Marshall takes another nap in the living room. Between 4 and 5, weather permitting, I try to take him for a walk. He gets so excited, very animated at the idea of a walk that he starts up that howl that Beagles are known for, especially when he sees the leash in my hand. The walk usually takes us around our subdivision, where I am always amazed at the amount Marshall’s bladder must be able to hold as he marks his territory in quite a few spots along our paths. When we first lived in the Rolla area, we were renting a house outside the city limits, and Marshall got used to the long walks on the country roads and lanes, but he did not like the cows and cattle we would walk by, often whimpering as we passed them. The cattle, for their part, usually ignored us. Marshall added a new habit while we lived at the rental house. He would nap until 9:00 a.m., then go outside to sniff and roam around and precisely at 9:45, he would bark to let me know that he was back. Then in he would come and the napping would begin in earnest. When we moved into our new home inside of Rolla’s city limits, we had a bit of a time with Marshall, as he thought he could wander and roam like he did out in the country, and through trial and error, we discovered how he was making his escapes from the fenced in back yard; under the gate there was a dip in the ground and he would force himself under at this spot until he gained the other side and freedom. After a weekend in Rolla’s Animal Shelter, Marshall was sprung, and a better eye has been kept on him ever since. Marshall can be smelly, causing a trip to Rolla’s Dog Wash, next to a new Car Wash on Kingshighway. He will knock over the kitchen trash can if he thinks he is the only one in the house, so we have to put it up when we are all going somewhere for a couple of hours. And when my husband goes to work in the morning, Marshall likes to get on the bed and snuggle up to me and keep on sleeping until the alarm clock rings at 6:30 a.m. He is a loyal dog, giving comfort to our youngest, who often wants Marshall to sleep in his room at night, snuggled against him and helping him to feel safe. Marshall wouldn’t be a very good watch dog because whenever a person comes to the front door, he wants to greet them, usually in a friendly way. He will bark if he sees another dog walking outside past the house, so that warning does go out to us. Several cats in the neighborhood watch us when we walk by their master’s houses, but Marshall usually ignores them, and I think the cats are puzzled at his indifference. When Marshall, who is now 7, goes on to his doggy reward, I don’t know if I will want another pet. I am assuming that by that time, most of our children will have left the nest, and I don’t think my husband will want he and I to have a dog underfoot. Mr. Vest’s summation won the case for Charles Burden, and it brilliantly showed the love and faithfulness that a dog has for its owners. I am glad Marshall became a part of our life, so very glad we agreed to take him in to avoid his having to go back to the animal shelter. Glad that we could ease Elizabeth and Tim’s minds about what would happen to their dog. Marshall is a great dog and adds to much our family’s life. Coren, Stanley(2009-10-21), ” A Man’s Best Friend is his Dog” The Senator, the Dog, and the Trial. Psychology Today. President Obama has taken the oath of office for the Presidency of the United States and his second, 4 year term has begun. What I kept thinking about today while this was occurring was how fortunate I was to live in the United States of America, for the reason that this event could happen without fighting, warring, or military coups, trying to jockey for the power to run the country if their candidate failed to win the election. 13 years ago, a friend of ours went on a mission trip to Western Africa. With his skills as a carpenter, he went on this trip to help a mission group build some new buildings in the community they were serving and living in. While he was working with the mission, some local men in the community also came to help build the new structures. They were a friendly group of workers, asking our friend questions about the United States. As the vote counting battle was ongoing back in the United States, Al Gore vs. George W. Bush, these local men told our friend that they were amazed that this vote counting was going on so peaceably. They said that if that had happened in their country, there would have been bloodshed by now. They went on to explain to our carpenter friend that their country was made up of 4 or 5 different tribal groups and that no tribe trusted any of the others. That is the way of most of the African countries, our friend was told. They went on to further explain that when their country would have an election, and one winner was from one of the 4 or 5 tribes, the other tribes would automatically cry foul and threaten to battle unless things could possibly be worked out to all tribes’ satisfactions. If not, then battles would happen. Goodness, but after I heard all of that from our friend after he returned from his mission trip, it made me very glad that I was born and live in the United States. President Washington, all those years ago, in his parting speech upon retiring after his second term, warned Congress not to become divided up into political parties. As we all know too well, our government did divide up into political parties, with two parties having remained the dominant ones of all the past variations. Some of us in this country are very glad that the President was re-elected to serve for 4 more years, some of us are not glad. However, those who didn’t vote for the President aren’t running around in their cities and towns, gathering up arms, militias, and heading to the nation’s capital to try anything radical, dangerous, or crazy to oust the President. Those who disagreed with the election’s outcome accept it and move on with their lives. Above all else, we remember that we are Americans. We live in the greatest country on this earth. Why do some many people immigrate to this nation that we Americans proudly call home? I don’t know why my ancestors left France and Germany to come to the United States but I am so glad that they did! I did tune in today to see the President take his oath from the Supreme Court Justice, and to see what the stylish ladies in Washington D.C. were wearing. I did hear the songs by the choir and some famous singers, and I enjoyed the strains of famous melodies played by the United States Marine Corps Band. After I turned the television off to get on with my day, I felt mostly a sort of pride, that our country can come together as a new President or a re-elected one takes the oath, and it is all done peaceably, with malice towards none. Over the Christmas holiday, I decided I had better watch some of the movies I had tivoed from the Turner Classic Movies cable channel. During the month of December, the channel had decided to air several of director Preston Sturges‘s comedies. Sullivan’s Travels aired, as did The Palm Beach Story and The Lady Eve. My favorite of the batch that they showed was 1944’s Hail the Conquering Hero. The movie’s cast is headed by Eddie Bracken, with wonderful supporting cast members : William Demarest(Uncle Charlie from the My Three Sons tv show), Ella Raines, Raymond Walburn, Franklin Pangborn, Elizabeth Patterson, Georgia Caine, and Al Bridge. Sturges’s films are predominately screwball comedies with a bit of drama thrown in and he often liked to hire the same actors and actresses to be in his films, many of the screenplays he wrote himself as well as doing the directing. In fact, he was nominated for an Academy Award in 1945 for this movie’s screenplay. Paramount, the studio where this movie was made, didn’t like that Sturges consistently hired the same actors and actresses for his movies and wanted to replace Ella Raines with a more well-known actress to play the girlfriend. Sturges wouldn’t agree to that and got his way, hiring the cast he wanted. The plot is as follows: Eddie Bracken is Woodrow Truesmith, and he loves the United States Marine Corps. He knows their military history, and even recites all of their famous battles up to that point in history in a funny barroom scene. His father was a decorated, yet fallen Marine, dying in the Battle of Amiens, in France during WWI. His mother has a shrine to her late husband in the family home. Despite Woodrow being an only child, with his mother’s blessing, as soon as he can, he enlists in the Marines. Off to boot camp he goes, only to be discharged for chronic hayfever! Woodrow is from a small California town, and after his discharge, he is too ashamed to face his mother so he finds employment at a factory in another California town and has been writing his mom letters as if he is really on a ship or on an island in the South Pacific. One evening at a local bar, as Woodrow is having a beer and feeling sorry for himself, a group of Marines enters the place. Woodrow buys them a round of beers and as they begin talking, he discovers that the sergeant of the group, Sgt. Heppelfinger, played by William Demarest, knew his father in WWI. Woodrow’s dad was Heppelfinger’s commanding officer. This coincidence forms a bond between Woodrow, Heppelfinger, and the other Marines in the bar. Woodrow explains his discharge to the Marines and he also tells them about his false letters to his mother. The false letters don’t sit well with this band of warriors, especially one Marine who was an orphan: it’s a pretty funny gag throughout the rest of the movie, the orphaned Marine always getting on Woodrow’s case about how he’s treated his mother! Sgt. Heppelfinger, unbeknownst to Woodrow, goes to the bar’s payphone and finds out Woodrow’s home phone number, calls Mrs. Truesmith, and informs her that Woodrow was wounded, but is fine and will be coming home just for a few days in order to see her. The sergeant’s plan is to get Woodrow home to see his mother, and then get him back to his factory job, with mother none the wiser about his really being discharged for chronic hayfever. Woodrow is horrified by the sneaky plan and balks at wearing a Marine uniform as he is no longer active duty. He worries he’ll be found out as a faker and thrown into jail. But the lively group of Marines, led by Sgt. Hepplefinger, resolve to protect Woodrow, to help him see his mother, and then help get Woodrow back to his factory job. What the sergeant and his band of Marines don’t know is that Woodrow’s mother has told her friends, who have told the entire town, and the mayor and the city council, and a huge “Welcome Home Woodrow” event has been planned, and the entire town is coming to greet him and his new Marine buddies at the train station! Sturges’s screenplay pokes fun at politics and politicians, at hero worship, and small towns. The pokes are gentle, though, and the humor shines through in the dialogue and the acting. As WWII was still being fought when this movie was being filmed, there are nods to patriotism throughout the film too. Being a mom of an active duty Marine myself, all the bits in the movie about the Corps made the film even more fun for me to watch. Eddie Bracken is great, as the increasingly frazzled Woodrow, who wants to stop this snowball of a “Welcome Home Woodrow You’re Our Hero!” movement, but he knows that the truth will hurt his mother the most. He also has a former girlfriend, Libby, played by Ella Raines, to deal with as she is engaged to the mayor’s son, but isn’t really sure if she loves her fiance or still loves Woodrow. Raymond Walburn and Al Bridge are great as the pompous Mayor and his political henchman, trying to get re-elected, and when the city council members who don’t like the current mayor want Woodrow to run for mayor, the situaton for poor Woodrow gets even crazier! If you want to see a movie with wit, charm, and great humor, then this is an excellent movie to see! Our government and it’s budget crisis, spending money like there’s no tomorrow crisis, raising taxes on practically everyone, I don’t understand some of the reasons for these actions. I keep thinking of my household and the financial decisions my husband and I have made these past 24 years. If we had dared to treat our family budget the way the United States government does theirs, we’d have been thrown into debtor’s prison long ago, if debtors’ prisons still existed! Agenda one: the Debt Ceiling. From the bit of research that I’ve done, the Debt Ceiling concept began in 1917, as our country entered into World War I. The concept became reality during World War II. To fund the First World War, the U.S. Treasury Department sold Liberty bonds and the creation, sale, and management of those bonds brought about the Second Liberty Bond Act of 1917. Allowing the Treasury Department to sell long-term bonds, marketed to the American public, the government was able to hold down interest costs. Prior to World War II, there were so-called mini debt ceilings, but each one differed in their amounts and were set for different expenditures or projects. In 1939, Congress got rid of all of the mini-debt ceilings and just rolled them all into one debt ceiling. By doing this, creating one debt ceiling, Congress’s new action gave the Treasury Department more freedom to take care of debt as they saw fit. Since WWII, the debt ceiling has been raised about a dozen times. 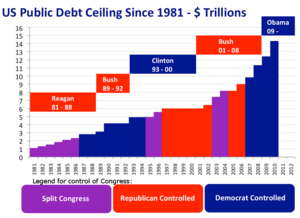 I find it very ironic that when there was a Republican president, the Democrat leaders in Congress were very vocal about their not wanting to raise the debt ceiling one iota. However, now that one of their own party is in the Presidential office, they are 100% in favor of raising it. My point in this bit of financial history is that many Americans are in debt and trying to get out of debt. We cannot visit our credit card companies and ask for our debt ceilings to be raised. I think it is time for the U. S. government to get their financial house in order. Go through all departments, trim out the unnecessary jobs, the unnecessary projects, and get spending down across the board to what the government actually can spend. As humorist Dave Berry once wrote, the person in charge of all U. S. government spending should be a single mom who has raised 5 or more kids. She knows how to tell a kid no, we can’t afford those tennis shoes. She would certainly be able to tell a Senator that no, he can’t have that $15 million for his state to study methane gas produced by dairy cows! My husband and I regularly go over our budget to determine if we need to scale back spending in any areas, and try to increase savings too. I don’t understand why the government can’t do that also. Agenda two: Spending, spending, spending. This concept is very logical. Do not spend more money than you have! Ah, but then there is that rectangular plastic card that lets one do just that. Years ago, when I was about to venture off to college, my dad sat me down to have a “financial talk”. My dad is a pretty logical thinker and he told me his theory on credit cards. That if at the end of the month, I found that I wouldn’t be able to pay the bill, that I should then take my credit card and destroy it, cut it up and throw it away. He said people not being able to pay their credit card bill at the end of the month causes a lot of problems if those folks keep on using that credit card and then they start to rack up higher and higher debts on it. Our government should listen to my dad! Agenda three and then I am out: Taxes. I don’t have as much to write about taxes and Mark Twain‘s pithy saying is so appropriate about there being two certainties in this life, death and taxes. I did read an article a month ago, that the increase on the 1% of wealthiest Americans, a so-called punish the heiress, i.e. Paris Hilton, tax would have a very detrimental effect on those farmers and ranchers who own land and a family farm that they want to pass on to their children who want to keep running the family farm. The increased tax the heirs would have to pay would be exorbitantly high, and those family farms will have to be sold instead of passed on to the heirs, which is very sad. I think that example shows how the government tries to come up with a new project or plan, hoping to do so for the public’s good, but all the public is really left with are unintended consequences. As Milton Friedman once said, “Nothing is so permanent as a temporary government program.” I understand why a government collects taxes and why citizens should pay them. But it sticks in my craw to know that the taxes our family pays are spent on frivolous pork, i.e. wasteful government programs. Remember the GSA debacle in Las Vegas? That cost we the taxpayers $ 823,000, at least! To sum up, if my family has to live on a budget, not spending more money than my husband earns, then how come the U. S. Government can’t run itself the same way? That is what I don’t understand. When I think of Florida, I usually think of sandy beaches, the Atlantic Ocean or the Gulf of Mexico, seafood, Disney World, vacation time! My movie pick recommendation for this weekend shows another side of Florida: MGM’s The Yearling, a technicolor masterpiece from 1947. This movie was based upon Marjorie Kinnan Rawlings novel, which was published in 1938 and won the Pulitzer Prize for Novel in 1939. Rawlings lived in Central Florida and wrote a touching story about a boy and his parents, living near New Lake George, Florida, in 1878. The film was directed by Clarence Brown, produced by Sidney Franklin, and starred Gregory Peck, Jane Wyman, and Claude Jarmin, Jr. Gregory Peck plays the part of Ezra Baxter, veteran of the Confederate Army, trying to eke out a living on his central Florida farm. He has one son, Jody, played by Claude Jarman, Jr., whom he loves very much, and tries to teach his son how to farm and hunt. Jody, for his part, loves to be outdoors observing the Nature around him, and he clearly loves his Pa. Ora Baxter, or Ma, played by Jane Wyman, is not as loving to her son as she should be. She is an efficient homemaker but is often grouchy and gruff towards her husband and especially her son. As the movie unfolds, the reason for Ma’s coldness will be revealed. There is another family in the film, the Forresters, whom Pa Baxter feuds with. Jody, despite the feud, is best friends with the Forresters youngest son, Fodderwing, an invalid who loves animals. One day as Jody and Pa are out searching for their stolen pigs-the Forresters had stolen them-Pa is bitten by a rattlesnake. Jody knows that a deer’s liver will draw out the poison and he finds a deer nearby and kills it, successfully getting the animal’s liver to his Pa, and the poison is dealt with, Pa survives. He and Jody soon discover that the dead deer was a doe, that she had a fawn so they begin searching the nearby scrub forest and Jody finds it. Jody has longed for a pet, to which his Ma has always said no. Survival is keen on Ma’s mind and she has always said a pet just takes food away from the family. Pa convinces her to allow them to let Jody raise the fawn for one year, then he tells Jody that at the end of that one year when the fawn will be a yearling, that Jody will have to return the fawn back into the wild. Jody is ecstatic at finally having a pet and agrees to his Pa’s plan. The fawn is soon named Flag, due to how a white-tailed deer’s tail stands up like a flag when it runs. All seems to be going well with raising this deer, Jody is enjoying being a pet owner. However, the year passes quickly by and a problem develops, that threatens the family’s survival; their corn crop is providing too much temptation for Flag. I won’t reveal much more of the movie’s plot, but I will say it is a moving film so have kleenaxes at the ready! At the Academy Awards for 1947, The Yearling won Best Art Direction-Color, Best Cinematography-Color; the scene where Jody finds the fawn is lush and gorgeous to view! 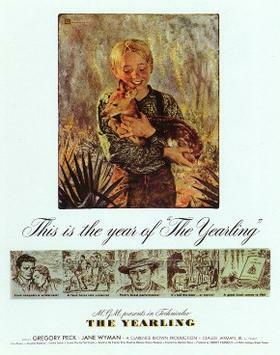 The Yearling was nominated for but didn’t win : Best Actor, Gregory Peck, Best Actress, Jane Wyman, Best Director, Clarence Brown, Best Film Editor, and Best Picture. Claude Jarvin Jr. did win a special Juvenile Performance Oscar for his efforts portraying Jody. Gregory Peck looks so young in this movie. He does a passable southern accent, but his portrayal is focused on being the loving husband and father to his wife and son. He portrays that very well, and is very patient towards his wife, trying to be the buffer for his son, to protect him from Ma’s coldness. Jane Wyman gives an outstanding performance as Ma. In the beginning of the film, the viewer won’t like her, but as the story unfolds, one will realize why she has steeled herself from showing her son any affection. Her character will go through a monumental change and it’s good to view it. Claude Jarvin Jr. is pitch-perfect as Jody. A boy of 11 or so, wide-eyed and in love with Nature. He is an obedient son, clearly loves his Pa, and tries to not burden his Ma with his activities. The cast is rounded out with character actors Chill Wills, Henry Travers(he most famously known as the angel, Clarence, trying to earn his wings by helping Jimmy Stewart in It’s A Wonderful Life), and Forrest Tucker. The Yearling is truly one of the best family films ever made. It’s a tender story about love, growing up, and responsiblities. The movie is peppered with heartfelt, believable performances by the entire cast, shot in gorgeous technicolor. What’s an F and L ? In December of 2001, my husband surprised me with two tickets to Hawaii! He had frequent flyer miles he needed to use or lose, so he decided to surprise me with the tickets at Christmas, the trip we would take would be in April, 2002. He had arranged for his parents to come to our home in Florissant to care for our 6 children, who at that time were ages 9, 7, 5, 3, and 1 year old twins. I was so excited with this present because I had always wanted to see Hawaii. I think my longing to see Hawaii was due to repeated viewings of The Brady Bunch and that 2-part episode when they got to go to Hawaii! While on our vacation there, we went on a tour boat/snorkeling outing and while boating out to the snorkeling spot, two of the tourists on board were regaling us about their trip to a pineapple plantation. “That was an F and L!”, one of them declared. Puzzled, another tourist asked what was meant by an F and L ? The answer quickly came. “An F and L means a First and Last, as in that was the first pineapple plantation tour we’ve been on and it will be the last!” That term quickly stuck with my husband and I and since that vacation, we have had several F and L’s in our family’s life. crowned two winners: the boy and the girl who had the most watermelon seeds. As my husband started to cut the watermelon slices, I brought out the Dixie cups for the kids to spit their seeds into. As the watermelon eating commenced, my husband quickly realized that it was going to be a messy business counting those watermelon seeds. Betsey’s book had not mentioned how gross or how messy this part of the party would be. We quickly found some newspapers, spread them out on a card table that we had on the back porch for the party, and had each kid dump their precious seeds on a specific section of the newspaper. My husband, who had thought about the logistics of this party more than I had, got a marker and drew a circle around each child’s pile of seeds and wrote their names next to their piles. The disgusting task of counting those seeds covered in 6 year olds’ spit fell to my husband, and we were able to determine who the King and Queen of watermelon seeds were. Unfortunately, our daughter was the girl who had the most seeds and after explaining to her that she couldn’t be the Queen of seeds at her party because she was the hostess, the King and Queen were awarded their fabulous prizes. After our daughter had dried her tears, it was time for the kids to run around the backyard some more and play at the playground. Later that August we did find 3 baby watermelons growing in a flowerbed in the backyard! 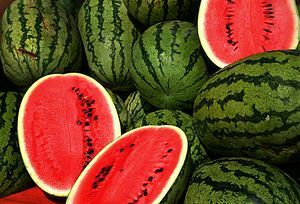 Looking back, I think the invited 6 year olds did have fun at the party, but after dealing with our sad daughter who couldn’t be the Queen, and counting the saliva-coated seeds, my husband and I decided that a Watermelon Party would be an F and L! Moving forward 5 years, I had a brilliant plan. Each month, we would go on a family outing, in the greater St. Louis area, that would be free to the public. January arrived and I told the husband and the kids that we would bundle up on Saturday and go to see the eagles at Fort Bellefontaine Park, that a birding club was going to host a group of wildlife folks bringing eagles to the fort and we could learn about these birds, plus there would be free cocoa for all, and no entry fees were being charged to see the eagles. We bundled ourselves all up, drove to the old Fort Bellefontaine grounds, and got there as the cocoa was being put away, the wildlife folks and the eagles had left! I had gotten the times for the event wrong and we had missed it all! After enduring the whining and grumblings from the kids, we decided to read the plaques on various buildings around the fort since Lewis and Clark had actually spent some time at old Fort Bellefontaine. We were also able to look out from a stone staircase, built by the WPA during the Great Depression, at the Mississippi River, amble down the hill to the river’s edge, and take our kids’ pictures sitting on some old cannons near that staircase. This outing was definitely an F and L to our kids, but a memory I can smile about now. I learned several lessons from that F and L: to know my times for an event, to take the comments from the kids in stride, and to have a camera ready to take photos because even an F and L can lead to precious memories.